CHICAGO (AP) - Rookie Corey Crawford got his first start this season for the Chicago Blackhawks and played like a seasoned veteran. Crawford stopped 19 shots to earn his first NHL win and shutout in his first start, leading the Blackhawks past the Anaheim Ducks 3-0 on Wednesday night. "The guys played awesome tonight," the 23-year-old Crawford said. "They didn't get any second shots and I saw the puck the whole game." Dustin Byfuglien and Cam Barker each had power-play goals and an assist, and Patrick Sharp also scored for the Blackhawks, who won their third straight and ended Anaheim's six-game winning streak. "I don't know about that," Barker said. "I think he had a great game, regardless. I thought he played the puck well, and for a rookie goalie to do that, I think it spoke volumes about how good he did." Crawford made just his second career start and fifth NHL appearance. He had been recalled from Rockford of the AHL on Feb. 22 after Nikolai Khabibulin, Chicago's No. 1 goalie, was sidelined with back spasms. Since joining the Blackhawks, Crawford had played just 44 minutes in relief of Patrick Lalime in two games before Wednesday's start. Lalime, normally Chicago's backup, had made seven straight starts with Khabibulin out. "You can't look at it like that or you give them too much respect," he said. "The two points, that's huge against a team like that." Chicago also ended a five-game losing streak against Anaheim. 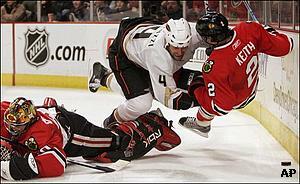 The Blackhawks hadn't defeated the Ducks since Nov. 17, 2006. Anaheim's Jean-Sebastien Giguere made 25 saves as the Ducks lost for just the second time in 13 games (11-2). "We didn't play very well, it's as simple as that," Anaheim coach Randy Carlyle said. "They had more energy that we did and their execution was to a higher level. Our offensive players for whatever reason tonight didn't have much going." Even the return of All-Star defenseman Chris Pronger, who missed two games with a broken jaw, didn't make a difference for the Ducks. "We didn't play to our level," said Pronger, who wore a face shield. "When we don't to that, teams beat us. We did get some traffic in front, but (Crawford) was able to see everything and they were able to box us out." Chicago outshot Anaheim 14-3 in the first period and held a 1-0 lead after 20 minutes. Byfuglien opened the scoring 7:07 in, knocking in a rebound from the crease. Giguere made a pad save on Cam Barker's one-time shot from the left side of the crease, but Byfuglien slid in the loose puck. The Blackhawks failed to score during a seven-minute power play - including two minutes at 5-on-3 - that began in the last minute of the first. The long advantage was set up when Anaheim's George Parros began punching Chicago's Ben Eager with 58 seconds left in the first, but Eager didn't fight back. Both Parros and Eager received misconducts, but Parros was assessed a fighting major and instigator minor. Parros said he challenged Eager after he and other Blackhawks appeared to be targeting Pronger. "A few guys were taking advantage of his injury," Parros said. Crawford faced only a handful of routine shots until late in the second. He made a shoulder save on Scott Niedermayer's shot from the slot with 2:20 left. During a Ducks power play, Crawford stopped Teemu Selanne's initial shot, then Ryan Getzlaf's rebound attempt from close range with about 5 seconds remaining. Barker was credited with making it 2-0 at 9:01 of the third. His shot from the right point was screened by Byfuglien and appeared to deflect in off him. Sharp was credited with a goal with 1:31 left to make it 3-0. He was hooked from behind by Pronger while trying to shoot at an empty Anaheim net with Giguere on the bench for an extra attacker. 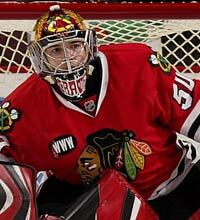 Notes: Crawford made his first NHL start on Feb. 2, 2006, at St. Louis, losing 6-5 in a shootout. ... Pronger broke his jaw Feb. 24 in a game against the Blackhawks at Anaheim. ... Ducks C Ryan Carter missed his fifth game with a broken wrist.